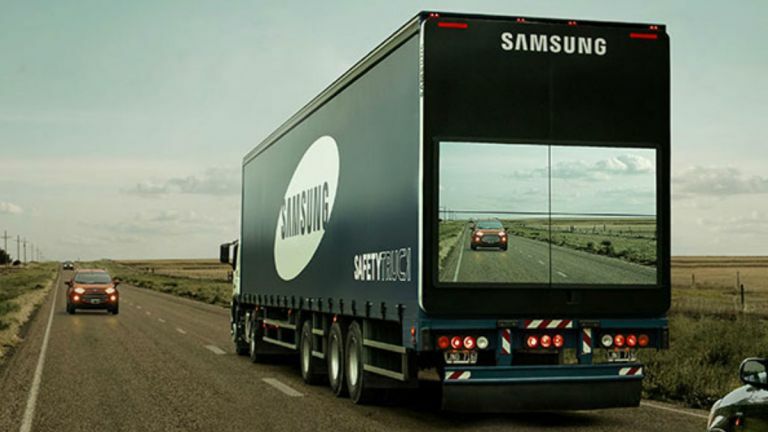 Trying to overtake a lorry can be a nerve-racking experience -- especially on single lane roads, but Samsung claims it can save lives though its safety truck prototype. You need not stress anymore. The prototype has a wireless camera on the front of the truck while a video wall integrated into the back of the lorry projects the road ahead, warning you if there are any cars coming or wild deer trotting across the road. Even if it's pitch black on a quiet country road, the safety truck concept will still deliver clear footage of the road ahead according to Samsung. The only thing we're not sure about is whether it will work clearly in the pouring rain, which is an all too common occurrence in the UK. It's pretty unlikely that lorry giants such as Eddie Stobart would start to use this tech on their lorry fleet, as it would probably cost them an obscene amount of dosh, but still we could start to see this kind of tech creep over to British roads pretty soon.